The Buffalo Sabres reported for physicals, etc. at the start of training camp on Thursday. They’ll be on the ice Friday for the first sessions, which are open to the public. In the area of good news, hockey is not football when it comes to these workouts. The team doesn’t go away for weeks before getting down to the business of preseason games. That begins Monday in Columbus, as the Sabres head to Ohio to play the Blue Jackets. Columbus returns the favor on Tuesday. Before we know, the Bruins will be in town on Oct. 4 for the season opener. But on the other hand, this will not be a short training camp in the figurative sense of the words. It will be a long one; it could last for many weeks. That’s because there’s so much that needs to be determined about this edition of the Sabres. New faces are everywhere, and most of them are young. Very young. No one knows how good they’ll be in the short term (October), in the longer term (December), or in the longest term (two or three years). Want some examples of the variables involved here? I’m glad to help. 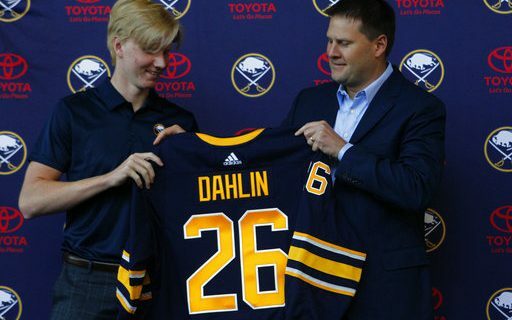 Rasmus Dahlin: He’s got every chance to be a great player in this league. We just don’t know when that day will come. Don’t expect an 18-year-old to be great at the position immediately. Watching his development in the weeks and months ahead will be a great reason to buy tickets or turn on your television. Casey Mittelstadt: The former No. 1 draft pick is in his first NFL camp after jumping from college late last season. Big things are in his forecast. But is he ready for the jump now? Will he have to spend some time on the third or fourth line to get used to playing at the game’s highest level? Would it hurt to have him go to Rochester for a few weeks and find his footing as a pro? That last possibility seems very unlikely, but the Sabres do have that option if necessary. Linus Ullmark: He has little to prove in Rochester after a good season there, and the Sabres cleaned out their goalies over the summer to open a path for him. It would help a lot of he’s ready to be at least Goalie No. 1 or 1A this season. Carter Hutton was a wise free-agent from St. Louis, and seems like a perfect complement for Ullmark. Sam Reinhart: Assuming he signs sometime soon, Reinhart answered some of the critics last season by picking up his play in the second half of the season. You’d have to say his scoring improvement wasn’t a fluke, but a full season at that level or better would put to rest a few doubts. Rasmus Asplund: If the Prospects’ Challenge means anything, and it probably doesn’t, Asplund is going to be a factor among the Sabres’ forwards at some point. When will that day come? If you are someone like Johan Larsson and Evan Rodrigues, you have to be a little worried that roster spots will be tough to wrap up with Asplund lurking. Lawrence Pilut: The Swede was signed as a free agent. The 22-year-old defenseman had a great year last season, and appears to have some offensive abilities. It would be silly to expect him to be ready to play in Buffalo right away. But if he does well in Rochester from Game One, he might force himself into the conversation about players who deserve a recall when injuries strike. Alexander Nylander: The winger never got going after an injury delayed the start of his season in 2018-19. He says he feels ready to go this time, and a jump in production would mean a lot for the team’s hopes of moving up the standings. The ex-Blues: Patrik Berglund and Vladimir Sobotka are veterans while Tage Thompson is an interesting prospect. The trio came here in the Ryan O’Reilly deal, and the three are part of the mix up front that will need time to sort out. Phil Housley: Let’s be honest here. The Sabres fell all the way to the bottom of the standings last season. Yes, they were a little unlucky, and yes, they had some dead weight on the roster. Now the roster will be different, luck could be expected to even out, and expectations will rise. If the Sabres get off to a flat start over the course of the first six weeks, the future of the coaching staff will come up for discussion. That list doesn’t include some of the situations that are more attached to the start of the regular season. Jack Eichel will be expected to take another step forward this season, if only because his salary has gone up to elite status. Maybe Jeff Skinner can get him there. Kyle Okposo hasn’t much go right for him in Buffalo. It may be time for him to carve out a niche or face the prospect of going elsewhere. Zach Bogosian only lasted 18 games on defense last season. Justin Bailey and Nick Baptiste have to show they are more than bodies to be brought up in care of injury. And so on. At least, though, the Sabres appear to have options on who fits where. That’s going to make this an interesting season to watch, and it’s just getting underway.